This article is 165 days old. 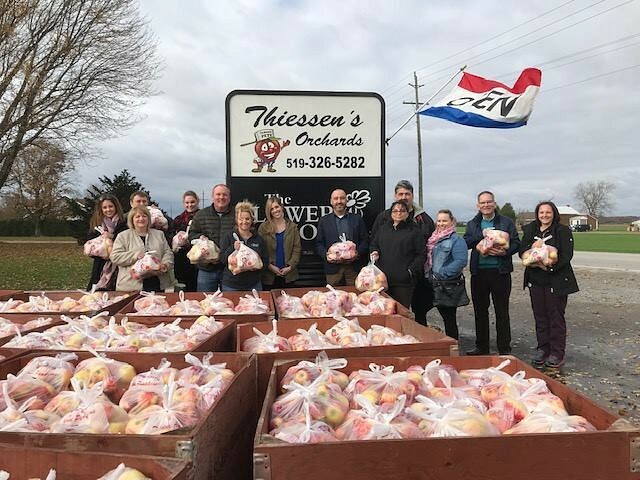 Thiessen’ s Orchards of Leamington donated 9,000 pounds of apples to families who receive services from the Windsor-Essex Children’s Aid Society. “Thiessen’s Orchards was very fortunate to have a bumper crop of apples and we are excited to be in a position that we can donate the additional fruit from our orchard to a great organization like WECAS. We believe that WECAS does tremendous work and are aware of the families in our area that would benefit from this healthy snack in their homes. This donation is a small way to give back to the community that supports us all season long. We appreciate knowing that the apples will be received by the families who will enjoy and benefit from them,” said Andrew Thiessen. The donation equates to approximately 1,500 bags of the fall fruit. “All of us at WECAS are extremely grateful to Andrew Thiessen and Thiessen’s Orchards for this wonderful gift to the families we serve. We are all about strengthening families and healthy living certainly contributes to overall success and positive outcomes,” said Derrick Drouillard, Executive Director of the Windsor-Essex Children’s Aid Society.